the Creative Orchard: INSPIRE: Ugly Sweater Party! Tis' the season for an Ugly Sweater Party and the Creative Orchard's shop has a DIY PRINTABLE INVITATION that was designed just for this kind of occasion! 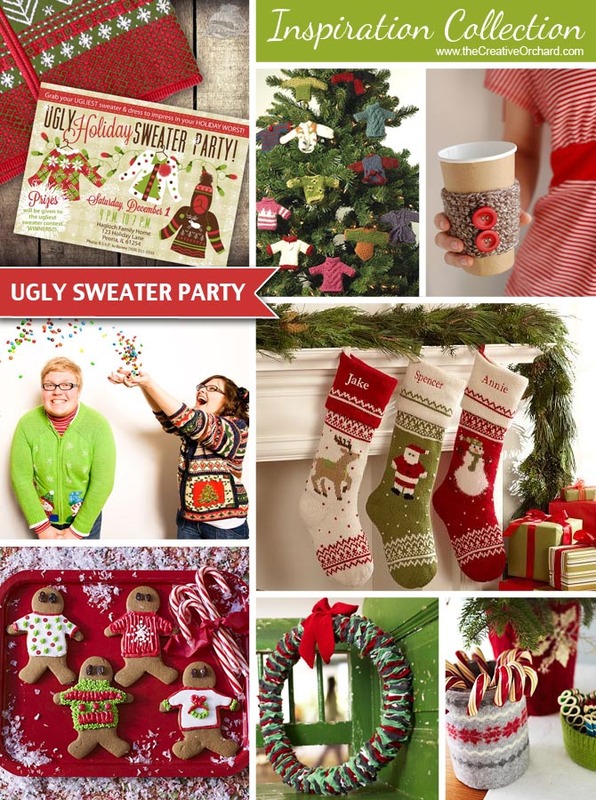 The Ugly Holiday Sweater Party printable invitation is ON SALE NOW for only $10! For a limited time it will be e-mailed to you within 24 HOURS! Just in time before the Holidays are over, you can still print your invite and mail it overnight, quickly send it by e-mail or share a digital version on facebook? Continue the UGLY SWEATER theme by decorating your entire party with tacky upcycled sweaters. Use old UGLY SWEATERS to cover vases filled with holiday treats, wrap presents/prizes, cut out tiny sweater ornaments to hang on the tree, display an advent calendar garland, sew stockings hung over the fireplace, design a wreath for your front door, make pillow slip-covers or create beverage cozies. Feel free to go crazy with SWEATER inspired decor and remember that nothing needs to look "pretty" because the UGLIER the SWEATERS, the BETTER the party!!! Set the mood for guests by temporarily converting a hallway closet into a photo booth with funny holiday photo props. Why should only the sweaters get be UGLY? In my opinion, the treats should be just as UGLY but taste YUMMY. Bundt cakes, jello molds, cheese balls, bread loafs, casseroles, meatballs, mini corn dogs, chili cheese dip etc. are not always the prettiest foods at the party but can still taste good. To encourage extremely UGLY sweaters, I recommend hosting a CONTEST where each guest votes on the sweaters by ranking different categories with points. Award PRIZES to the WINNERS with the most points! BONUS points for LIGHTS or SOUNDS! Such a cute concept and FUN party theme!